Sony is one of the top 3 leading companies on the PDA market. Sony’s model line width adds greatly to its popularity. None of company's rivals can boast about such quantity of new models per year. Sony doesn't rubber-stamp similar handhelds that differ slightly, it is on constant search for suitable form-factors and the filling. Note that over the previous year the company has used CPUs from three different manufacturers. And great variety of form-factors together with the high quality assembly makes Pocket PC platform users feel sad that Sony issues only Palm OS based devices. Conditionally the Sony models are divided by two groups: to the first belong low end handhelds without a keypad, camera, wireless adapters and with a 320x320 pixel resolution, to the second belong image models featuring the keypad, integrated camera, wireless adapters and a high resolution screen. There was no really "business" handheld from Sony for a long time. Only Sony TG50 could have been one of them (average price, integrated Bluetooth), but a small screen and hardly convenient built-in keypad prevented the handheld from being a sales hit. Several recent models break that classification. Sony TJ37 adds "wireless freedom" (standing for Wi-Fi) to budget models. The TH55, the model we talk about today, can be considered truly business one. Eventually Sony's admirers have got the handheld without a keypad and with a high resolution screen (they waited it for two years!). 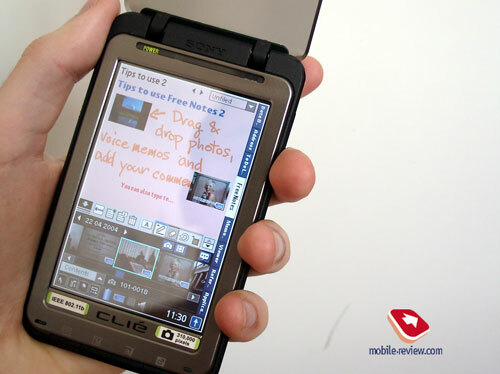 The handheld has a tablet shape (if not take into account its translucent flip cover) and is free from rotated cameras, folding shell or other extras. The shell is made of black shaggy plastic with glittering spots, and an aluminum framing protects the screen. In reality the device looks smaller than Sony’s keypad models from NX and NZ series – just 121.5x73.3x15.7 mm (13.4 mm width without the flip cover). For example, Palm Tungsten T3 unfolded measures 132x76x16.7 mm. The iPaq 4150 has smaller dimensions than the Sony model – 113.6x70.6x13.5 mm. The TH55 perfectly fits the hand and seems quite proportional. The shell feels nice to touch, doesn’t slip or creak and looks expensive. Two sides and top end are chamfered that makes the handheld more ergonomic. Many who tried the TH55 mentioned high quality of the plastic and its comparatively small size. Without the cover it weighs 165 g, somewhat perceptible in hand or in the pocket. The translucent cover is the matter of an argument. Someone likes it, others not. You can unscrew it if needed, though there would remain traces – not that awful like in case of the TG50. The TH55 has a dark, translucent plastic. This means you can easily use the handheld with the cover on indoors – view video files or read books, at that the image gets a little bit darker. Under the sunlight the cover transforms into a mirror, so it’s hardly possible to work. The producer claims the cover is scratch resistant, but we didn’t dare to verify the fact. The most of the front side takes the 3.9” screen, we’ll discus it later in the separate part of the review. Above the screen there is the LED indicators row: “POWER”, “REC”, “BLUETOOTH” and “WLAN”. Below the screen application buttons are located (CLIE Organizer Date Book, CLIE Organizer Free Notes and CLIE Organizer), the last button to the right launches the quick menu (browses applications, enters new PIM notes). By the standard way you cannot reassign this button. The keys are thin and somehow placed on the rib (where the front panel borders with the bottom end). Such dislocation makes the keys available with the cover on. Well, engineers did they best, but now you can use these buttons only to launch applications, forget about arcade games in this case. The main control elements are set back (to be more exact - between the top end and the bottom side)! Sony doesn't lack brave ideas. On the face of it the solution for the TH55 seems absurd, but in fact the things stand better. The jog dial perfectly fits the forefinger of either hand, besides you get used to it quickly. With the wheel it's easy to navigate the menu and read e-books, in all it is very ergonomic. If you press the wheel the enter function is activated. “Right” and “Left” buttons are located by the sides of the wheel. There's no problem to access the black “Back” button with the handheld in the left hand (in the right hand - not that easy). Nearby there are the camera and a not too loud dynamic. At the right side there are only the accumulator compartment and the infrared port. The left side is almost crowded with buttons and plugs. 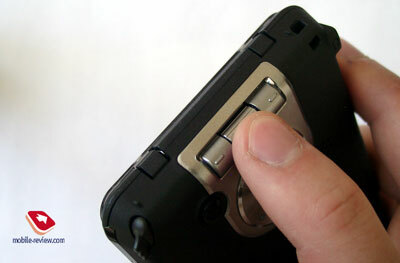 From top to bottom is the standard headphones jack (3.5 mm), the Picture Capture Button, a slider that opens and closes the lens cap on the TH55's camera. Below that is the cover for the Memory Stick slot followed by the amber LED indicator, then the Hold/Power switch. Finally, near the bottom, there's the voice recorder button. All switches function smoothly and neatly. The top side has the eye for the lace and the silo. The standard Sony stylus telescopes, and when it is closed it is just like a toothpick. Continuous work with Wi-Fi (the minimum backlight) – 14 hours!! 30 minutes everyday as organizer (default backlight) – 9 days. Sony TH55 enjoys the longest battery life for color screen PDA outpacing the recent leader Asus A620. We mean only standard batteries. Well, our respect to engineers from Sony. Such outstanding off-line performance is achieved also with the help of the processor developed by Sony. For the first time Sony applied its Sony Handheld Engine (SHE) processor in the models Sony UX40/UX50 last year. We’ll remind you about its special features. On a single chip rests the CPU (ARM-compatible ARM926) with 8 MB DRAM, 2D accelerator and controllers for memory cards and the camera. All this decreases the dimensions of the final device and lowers the power consumption. The SHE kernel is made under the DVFM technology (Dynamic Voltage and Frequency Management). The processor frequency automatically gets changed from 8 MHz to 123 MHz depending on the load. The results of the synthetic tests do not impress much and fully agree with that for Sony UX 40/50. In real conditions everything worked quick enough: video with the resolution 320x240 pixels, Flash-cartoons and Flash-games slowed down only in active moments (during boom scenes), the reader Picsel Viewer managed well with difficult documents. We suppose Sony made the right choice concentrating on the off-line performance. Initially the SHE wasn’t meant for playing arcade games. And with other tasks it copes well. The TH55 has 32 MB of RAM, all of which is available to the user. Incidentally, don't make the mistake of directly comparing the amounts of memory in Palm OS and Pocket PC models. The Palm OS handles memory in a more efficient manner, so a smaller amount of memory goes farther. The TH55's 32 MB is a good amount, though you'll probably want a Memory Stick for additional storage. Extra RAM would have lowered the off-line time, as memory chips draw power, even when the handheld is off. The company has made an odd decision – releasing the version with Wi-Fi for the American market and the version with Wi-Fi and Bluetooth for the European market. Sony thought that Wi-Fi is too popular in the US, so Bluetooth is unnecessary there. Similar decisions have made Dell and Toshiba refusing from Bluetooth version for the American market. Taking into account that the majority of grey supplies come to Russia from the US (at present there is no official shipment to Russia), so only the version without Bluetooth is available to Russian users. As for the WLAN networking noting failed with the HotSpot. It supports the direct connection between computers (Adhoc), 128-bit encoding and manual assignment of IP and DSN addresses. The thing that you won’t miss is the extended time of the off-line work (read about it farther). Naturally there is the infrared port. The TH55 can take any form of Memory Stick, including the Pro. For the sake of small dimensions Sony didn’t provided a CF slot. 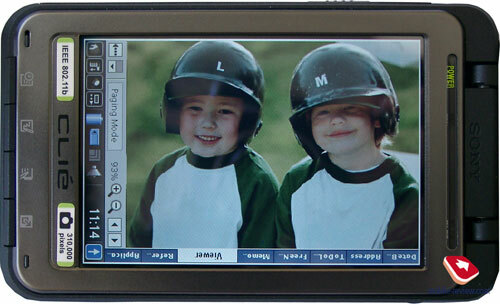 Physically, the screen is 3.9 inches across, displays 65,000 colors and has 480x320 pixel resolution. Its colors, contrast, backlight level makes this screen comparable with that for the Sony NX/NZ series and better than in Sony UX50/40 and Sony TG50. The image has rich colors, even backlight (without color spots at borders like in Sony TG 50). However, there is one significant area where the TH55's screen falls short. It doesn't offer complete landscape support, like palmOne's Tungsten T3 does. In other aspects the screens for the T3 and the TH55 are almost alike. In the next part we tell you about the camera, software and make some conclusions.